This popular book shows students how to increase their power to analyze problems and comprehend what they read using the Think Aloud Pair Problem Solving [TAPPS] method. First it outlines and illustrates the method that good problem solvers use in attacking complex ideas. Then it provides practice in applying this method to a variety of comprehension and reasoning questions, presented in easy-to-follow steps. As students work through the book they will see a steady improvement in their analytical thinking skills and become smarter, more effective, and more confident problem solvers. Not only can using the TAPPS method assist students in achieving higher scores on tests commonly used for college and job selection, it teaches that problem solving can be fun and social, and that intelligence can be taught. 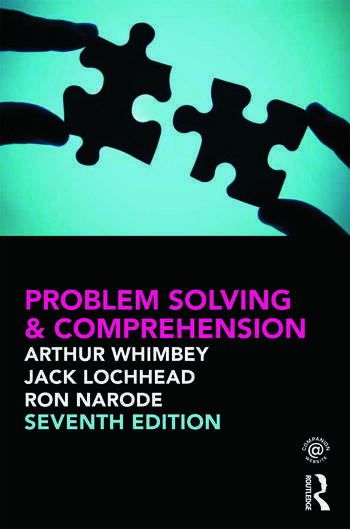 Changes in the Seventh Edition: New chapter on "open-ended" problem solving that includes inductive and deductive reasoning; extended recommendations to teachers, parents, and tutors about how to use TAPPS instructionally; Companion Website with PowerPoint slides, reading lists with links, and additional problems. Arthur Whimbey (deceased), a pioneer in the thinking skills movement, was a textbook author, consultant, and outstanding instructional designer whose creed from the 1960s was that intelligence can be taught. Dr. Whimbey was a member of the Association for Behavior Analysis, director of the TRAC Institute, on the staff of The New School for the Learning Sciences. Jack Lochhead, an active innovator, developer and researcher in the field of Cognitive Process Instruction, is Founding Director of DeLiberate Thinking, a company dedicated to helping schools, public agencies and private business develop instructional programs in the basic cognitive skills and was director of the Science Center at TERC in Cambridge, MA. He has had teaching positions at the University of Massachusetts, Mount Holyoke College, Harvard University and the University of the Western Cape. Ron Narode (deceased), is Associate Professor of Mathematics and Science Teacher Education, Department of Curriculum and Instruction, Portland State University Graduate School of Education. Previously he taught at the University of the South Pacific in Fiji, the University of Massachusetts, Amherst, and at the Universidad do Minho in Portugal during a Fulbright Professorship.